Born and raised in the Napa Valley, Kim's insider knowledge coupled with her perceptive business acumen makes her an invaluable resource when it comes to Napa Valley real estate. Kim earned a B.S. in Agricultural & Managerial Economics from UC Davis where she graduated with honors. After graduating, she sold highly allocated wines to top accounts in San Diego before moving back up North to become sales & marketing manager for her family's luxury winery in Napa. From there, Kim grew to become Operations Manager where she also assisted with expansion projects including land acquisition, vineyard development and cave construction. Kim's experience in business has carried over to her real estate career where she always puts her client’s needs first. 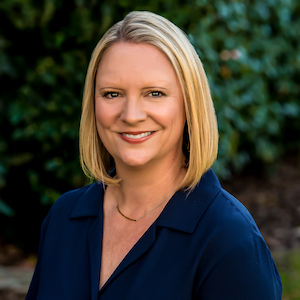 Kim stays on top of the latest market conditions & technology in order to skillfully assist clients looking to sell or acquire property in the Napa Valley. Kim is also uniquely qualified to position winery & vineyard properties to sell, having helped to market and educate discerning would-be buyers for her family's estate winery, and to help buyers find properties through her extensive connections in the wine industry. Kim is a cultured world traveler, having visited over 30 countries, attributing to her keen communication, organization & time management skills. With a commitment to excellence and success, and support from top industry leaders at Compass, Kim will tackle any obstacles head on and skillfully guide you through every step of your transaction. "Kim did an excellent job listing and selling my home. She came prepared with a professional marketing plan which generated a lot of interest in my property as soon as it was listed. She held 2 open houses, complete with French music, to complement my decor. My home was sold within 3 weeks at top dollar. I worked with Kim again when I was searching in Napa and Solano Counties for my next home where she looked daily for listings and took me to see dozens of properties. She found my forever home and negotiated successfully in spite of multiple offers. Kim is very detail oriented, patient, and devoted to her clients. She listens and sticks to client’s wish lists. She is an excellent agent for selling or finding the perfect home." - Beverly C.
"Kim was a wealth of knowledge and exceptional when it came to the whole sales process. She guided us from beginning to end and made everything really simple. Anytime I wanted info she got it to me within hours!! We really wanted this house and with her help we bought it within 5 days of it being listed!!!!" - Davide C.
"Kim is wonderfully professional and enthusiastic! I wanted to put in a bid on a condo in Yountville. She gave me comps, sliced and diced many ways to help me with me bid. The bid was submitted the next day. Unfortunately, I, embarrassingly, asked her to withdraw it the following day. She was extremely professional and courteous about it. I would use her in a heart beat if I’m in the market again. But since I’m not right now, I’m referring her to all of you!" - Babs C.